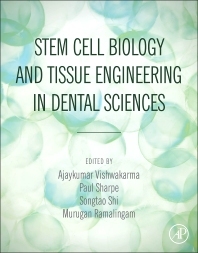 Stem Cell Biology and Tissue Engineering in Dental Sciences bridges the gap left by many tissue engineering and stem cell biology titles to highlight the significance of translational research in this field in the medical sciences. It compiles basic developmental biology with keen focus on cell and matrix biology, stem cells with relevance to tissue engineering biomaterials including nanotechnology and current applications in various disciplines of dental sciences; viz., periodontology, endodontics, oral & craniofacial surgery, dental implantology, orthodontics & dentofacial orthopedics, organ engineering and transplant medicine. In addition, it covers research ethics, laws and industrial pitfalls that are of particular importance for the future production of tissue constructs. Tissue Engineering is an interdisciplinary field of biomedical research, which combines life, engineering and materials sciences, to progress the maintenance, repair and replacement of diseased and damaged tissues. This ever-emerging area of research applies an understanding of normal tissue physiology to develop novel biomaterial, acellular and cell-based technologies for clinical and non-clinical applications. As evident in numerous medical disciplines, tissue engineering strategies are now being increasingly developed and evaluated as potential routine therapies for oral and craniofacial tissue repair and regeneration. Dr Ajay Vishwakarma is a researcher in the fields of stem cell bio-engineering, biomaterials, tissue engineering, cancer immunology and immuno-engineering; working with Division of Engineering in Medicine, Department of Medicine, at Brigham and Women’s Hospital, Harvard Medical School and an affiliate at the Harvard-MIT Division of Health Sciences and Technology at the Massachusetts Institute of Technology. Dr Vishwakarma earned a Doctors degree in Dental Surgery at Maharashtra University of Health Sciences and Masters degree in Tissue Engineering at Cardiff University, UK where he primarily studied signaling pathways involved in musculoskeletal repair and regeneration. He continued mesenchymal stem cell and tissue-engineering research during his fellowship in the Khademhosseini laboratory at the Harvard-MIT Division of Health Sciences and Technology, USA. Currently he is pursuing a PhD in Cancer Biology with training in Cancer Immunology at the Carver College of Medicine, University of Iowa in Prof. Weizhou Zhang’s Laboratory, Department of Pathology, Holden Cancer Center wherein he is studying how regulatory T cells impact cancer progression and metastasis in humanized cancer models. He was a recipient of a stem cell training fellowship from CCMB, a CSIR Indian institute, a graduate research fellowship by National Blood Foundation and National Cancer Institute government grant agencies. In addition to the long-term academic interest; he is committed to translating next generation cell-based therapies and has held key industrial positions in Europe and Asia. He is a co-founder of OCTE Technologies, a biotech start-up utilizing cell and tissue engineering technology platform to solve medical problems. Professor Paul Sharpe is the Dickinson Professor of Craniofacial Biology at Kings College London. He graduated with a degree in biology from York University (1977) and a PhD in biochemistry from Sheffield University (1981). Following postdocs in Sheffield, Wisconsin and Cambridge he became lecturer in molecular embryology at the University of Manchester in 1987 where he established a research group working on the molecular control of tooth development. Following promotion to Reader in 1991 he was recruited to his present Chair at the Dental Institute of Guy’s Hospital (later to merge with Kings College), where he established a new basic research department, the Department of Craniofacial Development and Stem Cell Biology. The department, of which he remains head, now consists of 13 academic research groups with over 80 research staff. From 2002-2008 he was Director of Research for the Dental Institute. His main research interests are the molecular control of tooth development, dental stem cell biology and tooth bioengineering. He has published over 270 research papers including articles in Nature, Science, PNAS and Cell press. He has supervised over 40 PhD students and receives funding from the MRC. He is a member of the MRC Centre for Transplantation and Biomedical Research Centre. In 2004 he was awarded the Craniofacial Biology Research Award by the International Association for Dental Research in recognition of his contribution to the understanding of how teeth develop and in 2006 his paper “Stem cell-based tissue engineering of teeth” received the William J Gies award for best publication is Biomaterials and Bioengineering from the same organisation. He is on the editorial boards of several journals including J. Dent. Res. and J. Clin. Perio. Songtao Shi, D.D.S., Ph.D., is Professor at the University of Southern California Ostrow School of Dentistry. Dr. Shi received his D.D.S. degree and certificate in Pediatric Dentistry from the Peking University School of Stomatology and Ph.D. in Craniofacial Biology from the University of Southern California. Prior to joining the faculty at the University of Southern California, he served as a Principal Investigator and Clinical Fellow for nine years at the National Institute of Dental and Craniofacial Research. His research program focuses on understanding mechanism of mesenchymal stem cell (MSC)-associated diseases, developing new experimental disease models, and exploring feasibility of translating these bench discoveries to clinical therapies. His group and his collaborators were the first to identify dental pulp stem cells, baby tooth stem cells, periodontal ligament stem cells, root apical papilla stem cells, tendon stem cells, gingiva stem cells, sclera MSCs, and benign tumor MSCs from keloid and ossifying fibroma. In translational study, Dr. Shi’s team has used these stem cells to regenerate a variety of tissues, including dentin, pulp, periodontal ligament, tendon, bone, bio-root. Dr. Shi and his collaborators were the first to use MSCs to treat systemic lupus erythematosus (SLE), periodontitis, bisphosphonate-related osteonecrosis of the jaw-like disease (BRONJ) in animal models and patients. Additionally, Dr. Shi and his collaborators were the first to generate BRONJ, osteoradionecrosis, keloid, and ossifying fibroma diseases in mouse and swine models. To understand mechanisms of MSC-based therapies, Dr. Shi’s team revealed that MSC mediated bone regeneration was regulated by recipient T cell, which is the pioneer study showing association between cell-based tissue engineering and immune response. Additionally, Dr. Shi and his collaborators discovered that MSC-mediated immunotherapy in human and mouse model is associated the interplay between the donor cells and recipient T cells via Fas/FasL pathway. Recently, Dr. Shi’s team first time showed that MSCs contribute to orofacial benign tumor development via an epigenetic regulation network. Dr. Shi has published more than 150 peer-reviewed articles in a variety of high-impact scientific journals, of which he served as the corresponding author in Nat Medicine, Cell Stem Cell, Lancet, J Clin Invest, Nat Biotechnol, Proc Natl Acad Sci U S A, Cell Research, Blood, J Bone Miner Res, Stem Cells, PLoS ONE, and J Dent Res. Dr. Shi’s research is supported by NIH grants and funding from California Institute of Regenerative Medicine. Dr. Shi has served on several local and national committees and boards including Scientific Editor for the PLoS ONE and Associate Editor for Oral Diseases. He is recipient of the 2013 IADR Distinguished Scientist Award for Pulp Biology & Regeneration. He is on the editorial board of Stem Cell Research & Therapy, the editorial board of World Journal of Stem Cells, and the editorial board of Chinese Journal of Dental Research. Dr. Shi is Changjing Scholar in the Fourth Military Medical University, Distinguished Visiting Professor in Tongji University, Visiting Professor in XiangYa School of Medicine & Stomatology, Central South University (CSU), and distinguished visiting professor in Dankook University, Korea. Dr. Murugan Ramalingam is Associate Professor at the Centre for Stem Cell Research (a unit of the Institute for Stem Cell Biology and Regenerative Medicine-Bengaluru), Christian Medical College Campus, India. Concurrently he is Adjunct Associate Professor at the Tohoku University, Japan. Prior to joining the CSCR, he was Associate Professor of Biomaterials and Tissue Engineering at the Institut National de la Santé et de la Recherche Médicale, Faculté de Chirurgie Dentaire, Université de Strasbourg, France. He has worked at the WPI Advanced Institute for Materials Research, Japan, as an Assistant Professor. He has also worked at the National Institute of Standards and Technology (NIST) and the National Institutes of Health (NIH), under the U.S. National Academies Associateship program. He received his Ph.D. in Biomaterials from the University of Madras. He has also undergone training in Ethical and Policy issues on Stem Cells from Harvard University, USA, and in Operations Management from the University of Illinois-Chicago. His current research interests are focused on the development of multiphase biomedical materials, through conventional to nanotechnology to biomimetic approaches, microfabrication, cell patterning, stem cell differentiation, tissue engineering and drug delivery. He is the author of over 190 publications, including peer-reviewed journal papers, conference proceedings, book chapters, authored books, edited books, and patents relevant to biomaterials, stem cells, and tissue engineering. His current h-index is 22. He has organized several international conferences and chaired Biomaterials, Nanobiotechnology, Stem Cells and Tissue Engineering sessions. He also serves as a board member of several international scientific and research committees in various public and private bodies and grant reviewer of various international funding agencies. He serves on the editorial boards of multiple biomaterials and tissue engineering-related journals, including as the Editor-in-Chief of the Journal of Biomaterials and Tissue Engineering, the Journal of Bionanoscience and the American Journal of Stem Cell Research. He is a recipient of several prestigious fellowships and awards, including CSIR Fellowship (India), SMF Fellowship (Singapore), NRC National Academies Fellowship (USA), Nationale Professeur des Universités (France), Fellow of Institute of Nanotechnology (UK) and Fellow of Royal Society of Chemistry (UK).